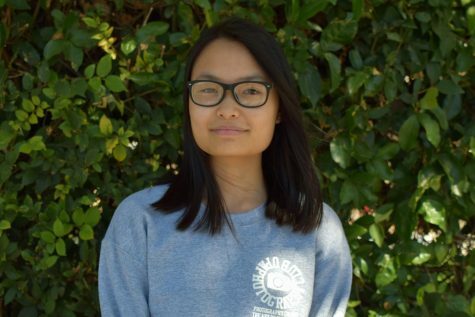 Sophomore Katherine Nguyen wishes to be a positive role model, even if she is shy. Katherine is bilingual with the ability to speak both English and Vietnamese. She loves to eat spaghetti and noodles, and she also likes cats, Forever 21, the smell of fresh air, smoothies, and the Starbuck’s Berry Refresher drink. Katherine describes herself as a strawberry shortcake because she has many layers to her identity, and the color white metaphorically represents how she learns from various experiences in life, similar to how white absorbs all the other colors. She has a preference for vacationing to any place that has a decently mild climate with fresh water, and she also loves chilly weather while relaxing on her bed. Katherine's favorite song is the sensational “Mamma Mia” by ABBA. She loves listening to K-Pop as well, and her favorite artist is BTS, a world-famous Korean boy band. If she were able to spend time with a celebrity, she would eat Asian, Mexican and Italian food with Ariana Grande.